The Jabra GN2120 Mono corded headset has a headband wearing style and is designed to be used with your desk phone, smart phone, or computer (each requires the correct connector cable). It has a noise cancelling microphone which rotates to allow it to be worn on either ear. The Jabra GN2120 Mono is a popular one with the loyal Jabra (previously known as GN Netcom) followers for its style and low price point. All corded headsets come with a brand specific QD (quick disconnect) connection and require a same brand adapter cable to make them compatible with your phone or other device. These range in price from $15 upwards. Many of these cables look the same but are different inside, so if you’re not 100% sure which you need, give us a call and our staff will gladly check for you. The Jabra GN2120 Mono is a good quality adaptable headset for those looking for something a little better than the basic. The GN2120 comes with a headband only wearing style The noise cancelling microphone prevents any unwanted noise being heard by your callers, while the flexible boom ensures perfect positioning. 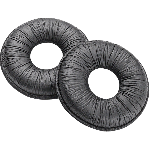 The stylish leatherette ear cups are small; however larger sets can be purchased to suit those who like more coverage. 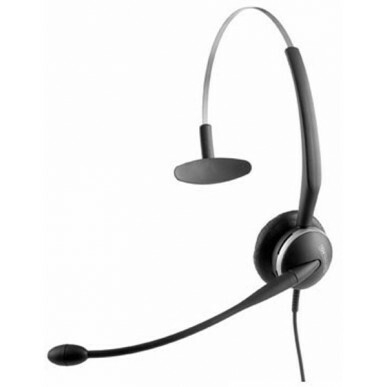 The Jabra GN2120 is a narrowband headset. If you do need wideband (eg if you are using VOIP), look for IP / HW headsets. The modular nature of this headset makes it a little less robust than some others, so if you plan to abuse your headset, maybe pick another model. < p>If you don’t have a headset port on your phone, a corded headset will take the place of your handset. If you still want to use the handset you can pick up a switch to allow you to swap between the two.As we’ve mentioned, corded headsets need connector cables, so don’t forget to factor in those costs when pricing up your headset. If you have a phone that is difficult to match for compatibility you may have to look at an amplifier. An amp, while providing superior call control (with mute and volume controls) and sound quality, will push up the price to about the same as a wireless headset (which have an amp built in), no brainer – if you need an amp, get a wireless headset! The Jabra GN2120 Mono is a good choice for those who want a stylish executive type headset. If you like the idea of having multiple wearing styles, but are interested in what other brands have to offer, check out the Plantronics H171N and the Sennheiser or the excellent CC530. As mentioned before, if the GN2120 is a bit dainty for you have a look at the GN2000 or Sennheiser SC 230 for a more robust solution. For users that are on calls for extended periods of time, or have a particularly noisy workplace the Jabra GN2125 Duo may be a better option to increase call concentration. If staff sit close together and it’s really noisy the ultra noise cancelling of the Sennheiser CC520 is definitely worth the extra investment. Another factor to consider is the extra productivity that can be gained from the freedom to walk away from your desk while on a call. It is worth checking out the Jabra Pro 920 which is a great entry level wireless option for only a small amount extra. noises over 118 dB SPL (RMS). earhook - or choose the brand new fourth option neckband. provide a unique combination of style and comfort. This is a brilliant headset. Simple to install, comfortable to wear for long periods and voice communications are crystal clear, even in a noisy office. If you're looking for a corded headset, I highly recommend this one. If had option would have rathered a wireless but if looking for a corded option then its ok.
Great product will purchase more.